5つ星のうち5.0This is the one to have. 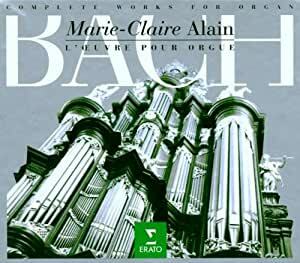 This is the third complete cycle of the works of Bach that Marie-Claire Alain has recorded. In the hands of many other artists, that might seem redundant, but she clearly has something new to say. Each piece is played with life and inspiration. The organs and the spaces they are in are gorgeous. The organs are all Baroque instruments, some that Bach may have played and others that are wonderful copies of period instruments. The recording is clean and captures, as much as possible, the feeling of listening to the music in the space. As a teaching or resource tool, this cycle is invaluable. The booklet with each CD includes a description, in French, German and English, of each piece along with the registration that was used. The pieces are easy to find and organized to make listening to a whole CD a delight. Though it doesn't affect the sound quality of the recordings, the packaging is amazing with different, artistic photos of the organs that are played printed on the CDs themselves and on the booklets. I love the way Marie-Claire Alain plays just about everything. She strikes the perfect balance between rythmic integrity and musicality. Her registrations, articulations and interpretations are based in a depth of scholastic knowledge without sounding boring or pedantic. I treasure this set and have never regretted making the purchase. It is wonderful, even got a hard rock buddy loving it too!!! There is no doubt that Marie-Claire Alain was one of the premier organists of our day. You would think that Bach's music recorded on near original instruments would be heaven for an organ afficianado. Fourteen volumes of organ anybody's organ music performed by anyone on any organ is a LOT of organ music even for an organist. I purchased this set, my third, to listen to the master's technique and registration and it is VERY good. It is not the kind of thing, however, that you want to listen to in one sitting or even in fourteen sittings. I have listened to the whole thing. I was looking for a definitive statement on phrasing and registration for use in my own performances. Certainly can't fault the technique but all the preludes and fugues sound alike, all the chorales sound alike, etc. I find myself wondering what Marie-Claire's OTHER cycles sound like. I may spring for one more. Haven't decided yet. Good in every way but not to be taken whole. The similarities in registration, interpretation and the overall sound overwhelm the the individual performances. I have the Ritchie cycle and am not satisfied with the technique althought it did not affect me way the Alain recording did. Also, I have the Richter recording. This is not a complete cycle. Superb technique and sound on the first two disks but the third was, I understand, recorded much later. Either the master was having a bad day, stressed or the recording is not good or something. Best left alone. Although I am partial to the Romantic Organ, particularly in the vein of Widor, Vierne and Rheinberger, it all begins with Bach. And in this case, one could say that it all begins with Marie-Claire Alain and her wonderful interpretations. Alain seems to understand that Bach was above all else a religious composer. Many "complete" works of Bach play short shrift with the liturgical works whereas these are some of the most satisfying of the group. The sound is pure sonority, almost perfect, and the technical prowess is just awesome. Out of the millions of notes played, I never heard a miscue or slight jiggle. Still, keyboard wizardry is only part of the story. The registration is a work of art in itself. Alain understand the difference between the Baroque and the Modern, the French and the German and the old and the new. Just as she is a "natural" for Widor or Vierne, she also seems to have entered the Bach mind on some of these. This is a fabulous collection worthy of any serious student of classical music. Nowhere can one derive such satisfaction that listenting to Bach played by Ms. Alain. ...In this category, can a true "best" ever emerge? Having said that, I can honestly tell you that this set is magnificent, having owned and enjoyed it since 1997. My only quibbles are that (1) some of Alain's registrations, while at the very least "good," are upstaged in several places by other performers whom I have on recording, and that (2) the recorded sound gives plenty of room to the organs' tones - sometimes _too much_ room, a problem that is also present on Alain's _Art of Fugue_ set, with the result that contrapuntal clarity gets smothered in a sea of reverb in some places (mind you, the "cloud of sound" approach works well with Bach's music, but I prefer clarity). Alain's technique and tempi, on the other hand, are untouchable. The disc with the trio sonatas is particularly good! I actually consider having multiple performances of Bach's music a must - my favorite set is Lionel Rogg's on Harmonia Mundi, but he is, by no means, definitive - and neither is Alain. They complement each other quite nicely!